St. Petersburg General Hospital, a 219-bed acute care hospital is fully Accredited by the Joint Commission on Accreditation of Healthcare Organizations. Among its many Centers of Excellence is The Women's Center, featuring family centered care. The focus of care is on the patient and family as one unit. The Breast Center features a comprehensive, multidisciplinary team of physicians who jointly diagnose, evaluate and educate patients about breast care, disease and treatment options. The Breast Center is ARC accredited and offers state-of-the-art treatments including the ABBI (Advanced Breast Biopsy Instrumentation) procedure and Neoprobe. St. Petersburg General Hospital's Wound Care Center offers comprehensive therapy to patients who need specialized, aggressive care to control non-healing wounds often due to diabetes or poor circulation. The Wound Care Center was the first such center to open on the west coast of Florida. 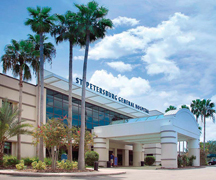 Today, St. Petersburg General Hospital offers a full spectrum of health care services with the support of over 400 independent physicians representing a wide array of medical specialties and backed by a highly qualified and skilled team of hospital professionals and employees. This care is offered in a comfortable setting and convenient location. St. Petersburg - Florida's fourth largest city with a population of a quarter million inhabitants - was incorporated as a city by the Florida State Legislature on June 6, 1903. During 2003, St. Petersburg celebrates its 100th anniversary, and shares this celebration with St. Petersburg, Russia, which is observing its tricentennial. In the Sunshine City, a year-long calendar of activities will commemorate the 100th anniversary, including events that highlight business, commerce, technology, education, international relations and trade, recreation, sports, the environment, tourism, arts, culture and the community as a whole. Official delegations from each city will exchange visits, while the two St. Petersburgs share their similarities and embrace their unique contrasts. St. Petersburg, Florida, enjoys a rich hundred-year history. It was founded in 1888 when the Orange Belt Railway chugged into the Gulf coast settlement for the first time on June 8th. Peter Demens, an aristocrat from St. Petersburg, Russia, was the entrepreneur who built the railroad and is credited with naming the Florida city.